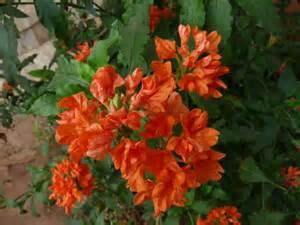 Crossandra includes about 50 species of evergreen perennial herbs and shrubs from India, Arabia, Madagascar, and tropical Africa. The upper lobes are spreading, fanlike. The common name, fire -cracker, alludes to the way the mature dry capsules pop when touched with a damp finger, explosively dispersing their seed – much to the delight of children. Birds and small animals eagerly dig up seeds, making it prudent to start with seedlings. Crosandras are a bit finicky about regular moisture and are inclined to drop leaves if stressed by heat or cold. Because new growth initiates at the ends of the branches, plants that suffer leaf loss should be cut back to the main stems in spring to avoid rangy regrowth. Remove old spikes to stimulate frequent bloom. Synonym: C. undulifolia, justicia infundibuliformis. India, Sri Lanka, central Africa. Evergreen shrub or subshrub, 1-3ft, zones 10-11. Blooms warm months. Regular moisture. Average to fertile, well – drained soil. Full to part sun, morning sun for good bloom. Flowers: salverform, tubular at the base, lobes 5, fanlike, yellow to orange, bracts covered with long hairs, bract veins not reticulated, inflorescence on a 4. to 6-in. stalk. Leaves: elliptic, glossy dark green, 3-5 in. long, blade tapering down the petiole, tips obtusely pointed “lutea” is distinguished by its erect, shrubby habit and yellow flowers. “Mona Walhead” is low and spreading with orange flowers. Tropical Africa. Evergreen shrub, 1-2 ft,zones 10-11. Blooms intermittently in warm months. Regular moisture. Average to fertile, well – drained soil. Bright filtered light, morning sun. Flowers: salverform, lobes fan-shaped, about 1 in. wide, ruby – red, brick -red to mauve. Bracts long haired, reticulated, in florescence a spike, stalk to 6 in.long, blade tapers down the petiole, tip abruptly narrows to a point. The petals are slightly smaller and more deeply lobed than those of C. infundibuliformis. Cultivated plants possibly include hybrids of that species.